When my college students assigned me books to read last semester I decided to get wild and crazy and let some of them bring me two books. I figured any student who dared assign me two books was probably a student who had something to teach me. The student who brought me Tina Fey's Bossypants also brought me Book #56, Steve Martin's Born Standing Up. I'm ashamed to say I planned on comparing and contrasting the two books and authors and finding them tied and equally crushworthy, forever and always. Five pages into Born Standing Up I see that I can't compare these two books at all. Steve Martin's tone is crisp, direct and reflective in this autobiography of the part of his life where decided to become a stand-up comic. 80 pages into the book I have to pull out a pen and mark up the parts that shimmer with extra wisdom like "Through the years I have learned there is no harm in charging oneself up with delusions between moments of valid inspiration." Excellent. I'm thinking of ordering myself a medical alert bracelet with that quote. Over twenty pages later, still describing his early lean days Martin remarks "When I think of the moments of elation I have experienced over some of my successes, I am astounded at the number of times they have been accompanied by elation's hellish opposite." I agree entirely, and blame this all on Newton's equal-and-opposite rule. My absolutely best most favorite part was Martin's reflection on the work he put into analyzing and improving his act, and how he saw concrete improvements from his consistent practice. "It was easy to be great. Every entertainer has a night when everything is clicking. These nights are accidental and statistical: Like lucky cards in poker, you can count on them happening over time. What was hard was to be good, consistently good, night after night, no matter what the abominable circumstances." Steve tells us how he feels about drugs (glad he doesn't do them), who he has dated, ("Were they beautiful? We were all beautiful. We were in our 20s'), and how he stayed focused on developing his art. 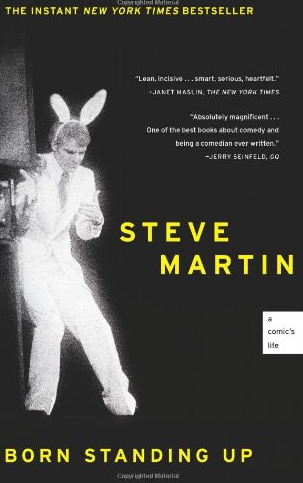 I have been a die-hard super-crushing Steve Martin fan forever, and now that I've read this book I am so pleased to find there's more about him to enjoy than I had imagined. Definitely read this book. I would lend it to you but I should give it back to Sara, and I can't do that until I read the book again and maybe a third time.